It is that time of the year again when business schools start preparing to take in a fresh batch of students, and student aspirants in turn prepare for the dreaded CAT, or common admission test, to get into these schools. 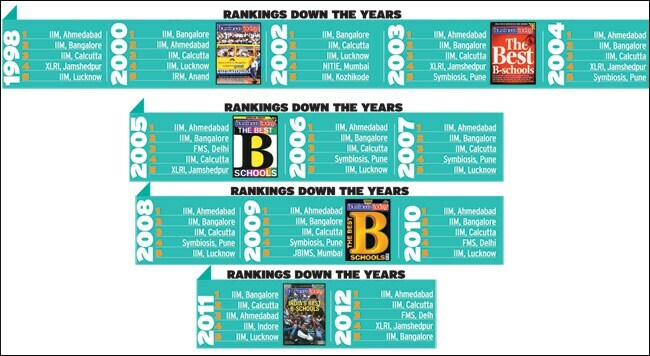 This is also the time when Business Today's ranking of India's top business schools is announced. 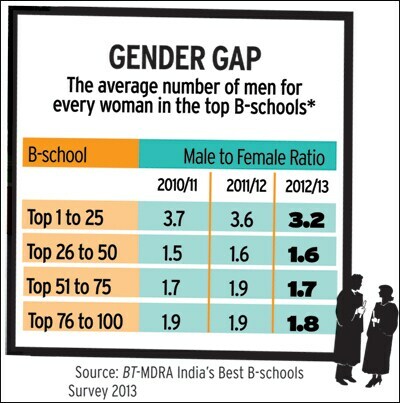 This year, the BT-MDRA India's Best B-schools Survey has gone one step ahead of last year's comprehensive overhaul. We have added a unique "experiential survey" of alumni - to the existing objective and perception surveys. This will give our readers the added advantage of alumni views to validate whether their business school's education actually faced up to market reality. This year, programmes of less than two years -- such as those offered by Indian School of Business or ISB, Hyderabad and Great Lakes Institute of Management, Chennai -- were not included, because we wanted to separate the regular two-year programmes from the specialised executive programmes. So this year we also have a separate ranking of executive programmes, in which ISB Hyderabad comes out tops. Given the increasing trend of people going back to school after working for a few years, this ranking had become necessary. What are the main trends? 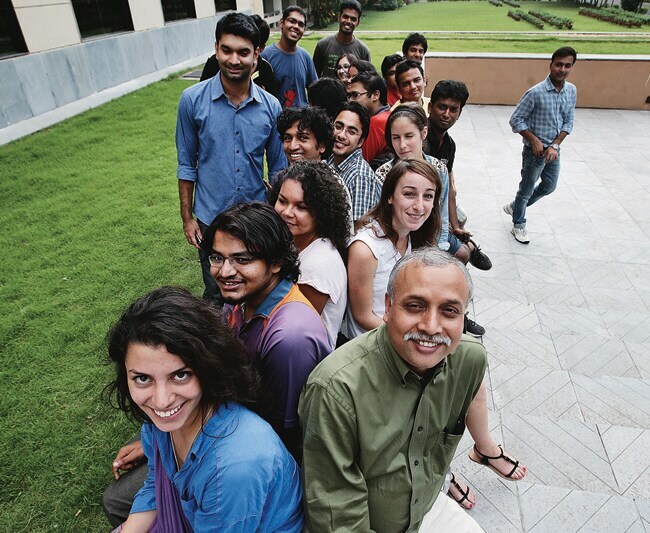 The economic slowdown has impacted placements at B-schools, including the best ones. "The downturn has taken its toll on placements in management education," says Ashish Nanda, the new Director of IIM, Ahmedabad (IIM-A). In challenging times, companies tend to scrutinise the cost of new recruitments closely, he points out, with some even postponing them. Ashok Banerjee, Dean, New Initiatives and External Relations, IIM-Calcutta, confirms the trend. "Till 2007, our students had no interest in public sector units, but thereafter many have been joining PSUs, especially the banks - opting for slimmer pay packets if job security is guaranteed," he says. Like last year, this year too, recruitment is likely to stay flat. Has this adversely impacted the demand for business education? Initial reports of the number of students appearing for the CAT, whose scores form the basis of admission at IIMs and other top B-schools, show a drop from 214,000 last year to 196,000 this year. But there could be other reasons for the fall. "Many students find CAT difficult and non-transparent. Also, the online format of the exam has tended to confuse and disengage some," says Ulhas Vairagkar, a 1980-batch alumnus of IIM-A and Director, Triumphant Institute of Management Education (T.I.M.E.) Education, which claims to be the largest B-school entrance exam trainer in the country. Indeed, other examination formats bear him out since they have seen an increase in numbers. For instance, the All India Council for Technical Education's (AICTE) Common Management Admission Test (CMAT) has added numbers of up to 140,000 applicants within two years. XAT, or Xavier Admission Test, conducted by XLRI, Jamshedpur, has seen the number of applicants go up to 90,000 from 60,000 last year. The other trend is that fewer B-school aspirants are looking overseas, thanks to the uncertain economic climate in many developed countries, especially Europe, and the continued fall of the rupee. "If anything, education here has become cheaper," says Vairagkar. Every year up to 300,000 students go abroad to study further, of which a large number study management. In 2012, for example, there were over 54,000 Indian international student enrollments in Australia, of which more than 31,000 were enrolled in management and commerce courses. "Australia has experienced some decline in Indian international student enrollments in recent years, due to various reasons, including student visa policy changes, the global financial crisis and the strength of the Australian dollar," says Vartika Bassi Sethi, Program Officer - Media & Advocacy, Australian High Commission, Delhi. The trend is borne out by Naveen Chopra, Chairman, The Chopras, which provides consulting services, among other things, to students wanting to study abroad: "MBA numbers have flattened out and even shown some decline. Interest has shifted to specialist programmes within B-schools," he says. Take Amit Ray. The 37-year-old graduated in the Post Graduate Programme for Executives, Class of 2013, at IIM-C, instead of going abroad. "While I did get admission into some of the prestigious institutes in Europe, the changing visa rules and economic climate played spoilsport. In India, I realised that IIM-A, IIM-B and IIM-C were the schools that could provide me with the experience I was looking for," he says. He is now country head at EiP, India, the Indian JV entity with a UK-based management consultancy called Inspiring Business Performance, or IBP. 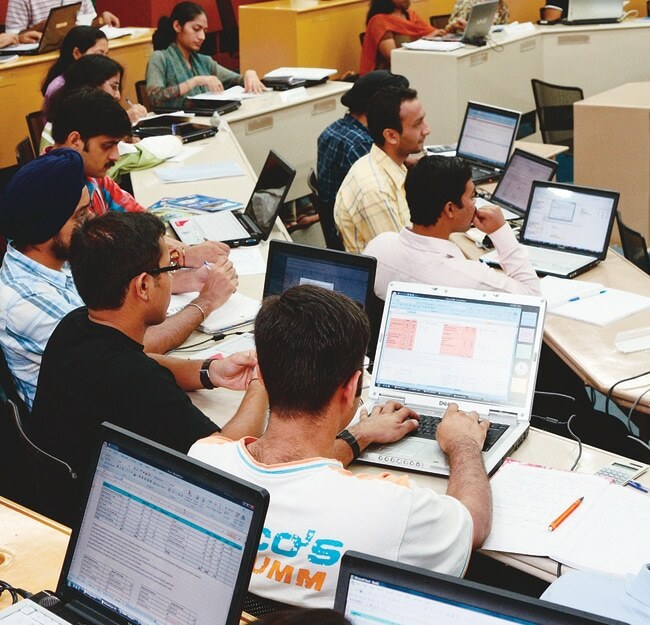 Indian B-schools are also looking to bolster their brand value through participation in global surveys and gaining international accreditations. Leading B-schools such as IIM-A, IIM-C and Indian school of Business (ISB), Hyderabad, have gained some traction in global rankings. 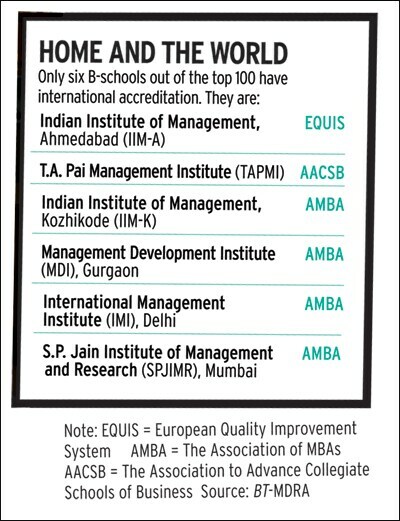 Six of the B-schools in our survey have acquired international accreditation (see Home and the World). These accreditations are globally accepted stamps of quality. We have a package of stories on the churning environment. First, there are the profiles of schools that did well. Then, we note the trend of many students opting for rural/agriculture and co-operative management. The hallowed IIMs are under pressure. The number of IIMs has increased, which means getting good faculty is more difficult than before. There is increasing pressure to do more and better research, which the faculty seem to be resisting. There is an appalling lack of takers for even the few token grants that are on offer. But it is not all doom and gloom. There are rays of hope in the way Indian enterprise is shaping up. Small beginnings are to be found in the way B-schools are encouraging entrepreneurship and innovation. 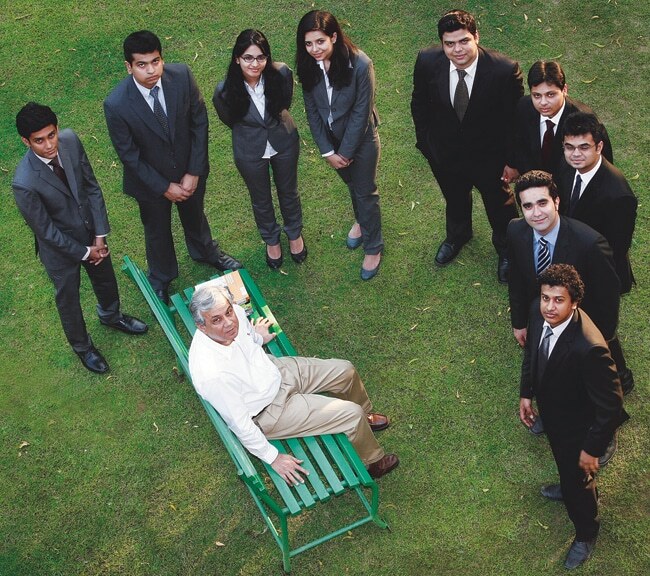 No prizes for guessing which school is doing it best - here too, IIM-A is the winner. Clearly, management education in India is maturing.